Summoner is THQ's first RPG offering for the PS2. The game is in DVD format, so you can expect an extensive game. You take the role of Joseph, a 19 year-old boy who's been given the mark of the Summoner and has been charged to save the world. While the story may sound as the usual "do some quests, kill some boss dude and win" plot, the game actually offers a sizeable number of twists and turns. But before we delve into that, let us get into the story a bit more. The game begins with Joseph's town in Medeva getting attacked by the Orenians, a neighboring region which is warring with Medeva. We later learn that this isn't the first time Joseph's hometown was destroyed, his previous hometown of Ciran was also destroyed, but it was destroyed by a renegade Summoning. The summoned creature attacked his town because he didn't have the power to control the summoning. Of course after all that's happened, Joseph swears to learn the origins and the significance of his powers. The adventure goes on from there, I won't reveal the rest, the game is too good to spoil. As for the twists and turns, the game is plenty of them. Just when you think you've done the very thing that will end the game, you're given a MORE important goal. This is one of the things that make Summoner a very extensive game. Now onto the gameplay and all that good stuff. This game was originally conceived as a CRPG (and is being released for the PC soon) and so it plays like a CRPG. The story is conveyed through comprehensive text delivered through the characters that you meet and also from cinematic scenes consisting of: hand drawings depicting the events or an in-engine cut scene. The action is very slow paced, even when you're tackling several monsters at once. The combat is done in real-time where the speed of your attacks are based on your speed rating. If you're wielding a super heavy long sword, then it'll take you a while to recover after a swing and so on and so forth. There is actually only one city in the game where you can get your equipment and after some events, that city will be inaccessible. No problem though because most of the game's most exciting items can be found from creatures and slain bosses. The game offers Chain Attacks, similar to those that were implemented in Vagrant Story. Chain Attacks are "combo" moves if you will that can lengthen the punishment you are dealing to a monster. If the correct directional button is pressed, then the corresponding Chain Attack that has been assigned to that button will be performed. This can help you pummel a monster with unlimited attacks, if you've got good timing. But of course unlimited attacks don't come free, in this case, they consume AP, or Action Points. Action Points are used for casting spells and performing Chain Attacks. As with most RPGs, regardless of being a CRPG or console RPG, leveling up can be done by killing enemies and accumulating experience points. But instead of the game deciding how to raise your stats, you get to decide. After a level up, you are given a number of Skill Points you can distribute to a number of skills, such as: BackStab, Weapon Skills, Spell Skills, Critical Hit, and many others. In this game, there are no Strength, Intelligence, or any of the usual attributes. Damage, Defense, and spells are decided by skills or the type of weapon or armor you have equipped. The game offers a ton of different items ranging from Long Swords to Health Elixirs. The game also has a few things that most RPGs lack in consoles these days: a map screen! !, quest log! !, save anywhere, and probably the most important of all, the ability to see EXACTLY what you equipped your characters! If you equip Joseph with a really bright pair of boots, then you'll see them when you control him! Most RPGs overlook this part of detail, I have seen Baldur's Gate utilize this, but since the game is mainly 2D sprites, the detail doesn't show as well as it does in Summoner. There is also the ability to summon monsters (duh!). Summoning cannot be done early in the game, but is only available when you have acquired a Summoning ring after you meet Yago, your guide. Summonings range from Imps to Minotaurs and Final-Fantasy-like Dragon Summons (summon 'em and they attack the enemy or aid you somehow, then leave). Summoning is one of the great features in the game, but sometimes the monsters are either dirt stupid or too easily killed, but its a good addition nonetheless. Enough with the gameplay, let us forge into the game's graphics and sound. Since Summoner is one of the PS2's launch games, gamers expect a game with unprecedented graphics and killer sound. This game is also one of the few titles for the PS2 that utilized FSAA or full-screen anti-aliasing. FSAA is a way to smooth out rough polygons and edges to make them look smoother and a game often looks horrible without it. The game has great high-resolution textures, but the character modeling leaves too much to be desired. The character modeling is lackluster, they look almost like the TimeSplitters models. For you who haven't seen both games, the models look like a bunch of bones with slapped on polygons. They aren't elaborate and often look weird, but the monster modeling is great, little runts look like little runts and the big boys really live up to their name. Even though the game boasts high-res textures, its framerate speed suffers. The game runs at a supposedly constant 30FPS. In small, indoor areas, the game chugs and runs at almost at 60FPS, but while in large, elaborate areas, the framerate drops like a severed limb. The game also suffers from horrible draw-in. Draw-in is a method of "hiding" far-away objects to increase the frame rate and is usually accompanied with a nice fogging effect to hide the draw-in. In Summoner, the draw-in is not hidden. It is as visible as the sun. Lenele's colossal walls pop up from nowhere and it is not a pretty sight. The game also suffers from incredibly long load times. The "save the game in case you die" tactic isn't as effective as it should be because of the extensive loading. It wouldn't have been as bad if the game only loaded when you restore a savegame, but every new area requires an over-minute load period. As for the sound, its the usual what you would expect from any RPG game. A system of grunts, yells, screams, and the sorts. The game offers great voice-acting though, the storytelling is great and the speech is crisp and clear. Unlike most games with voice-acting, Summoner's voice-acting is actually convincing . Even with all the graphical flaws, the game offers superb visuals that are awe-inspiring such as Iona which is a floating island temple. The high-res textures will also leave you staring at the floor or the shiny pieces of armor. Bottom line: Despite all of its significant problems, I found the game to be thoroughly enjoyable. 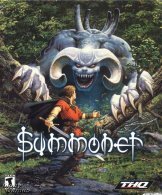 Summoner is hands-down the best PS2 launch RPG for the system, easily beating out Evergrace or Orphen. If you're choosing an RPG for your new PS2 system, get Summoner, you won't regret it.